I don't sell anything that I wouldn't grow in my own garden. All of the seeds listed are un-treated, non-hybrid, open-pollinated, non-gmo, heirloom seeds. Plants are grown using no chemicals. That was 3 years ago. Food prices are still going up! This weekend I shared a WSJ article Attention Shoppers: Fruit and Vegetable Prices are Rising. For those of us trying to become more self-sufficient, we already know this! 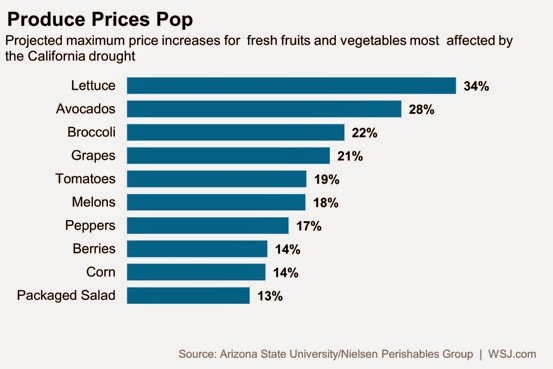 From the article, "The cost of fresh produce is poised to jump in the coming months as a three-year drought in California shows few signs of abating, according to an Arizona State University study set to be released Wednesday.The study found a head of lettuce could increase in price as much as 62 cents to $2.44; avocado prices could rise 35 cents to $1.60 each; and tomatoes could cost 45 cents more at $2.84 per pound. (The run-up in produce prices is in line with other projections showing that overall food cost gains are expected to accelerate this year.)" The prices listed above are most likely an average. Here in Florida, conventionally grown tomatoes are $3.99 a pound and almost TWICE that if you buy organic. If you follow the Midlife Farm Wife (or read the news) you know that Beef and Pork prices are going up as well. From her article Beef in the US...The Steaks are High, "Due to an extremely harsh winter and the loss of thousands of beef animals, South Dakota was terribly hard hit as early as October 2013 as reported in The Huffington Post, there is now far less beef available "home grown" beef. Coupled with the effects of the drought we suffered in the Midwest summer of 2012 which caused many beef farms to liquidate, there were less animals to begin with, PRIOR to the bad winter. Back to our country in general. In the 1980's the U.S. there were over 115 million cattle, now that number is less than 90 million which might explain why we import approximately 15% of our beef from Canada, Mexico, Australia and South America.Beef is obviously limited and beef prices are skyrocketing. The U.S. Department of Agriculture reports that the average price of ground beef in February 2014 was up to $5.28/pound compared to just $4.19/pound in 2013. A decade before it averaged $3.60/pound." What are my solutions for the rising cost of food? Well, I have several. First...GROW YOUR OWN VEGGIES! It really doesn't take a lot of time or effort to grow a basil plant or even salad greens. Arugula is an easy green to grow and takes approx 40 days. It needs soil, water and sun. Arugula can even be grown in a recycled plastic or wood container. No need to go out and spend a bunch of money. At Mary's Heirloom Seeds you can purchase a packet of non-gmo, open-pollinated Arugula seeds (300 seeds) for only $3.00! 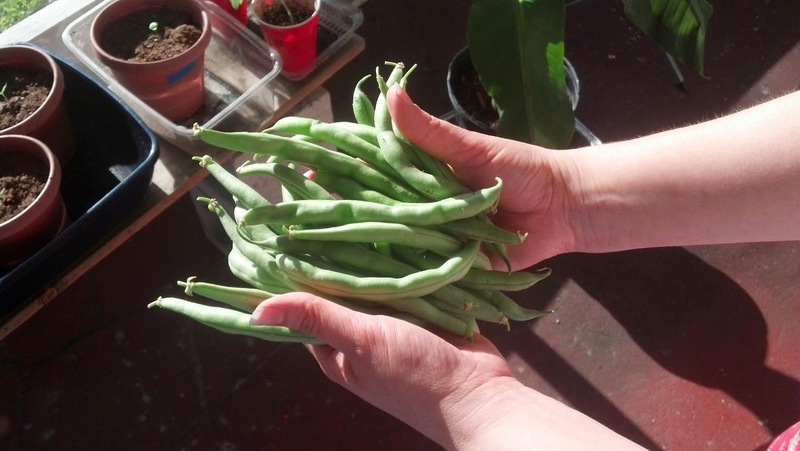 Homegrown Green Beans from seed! 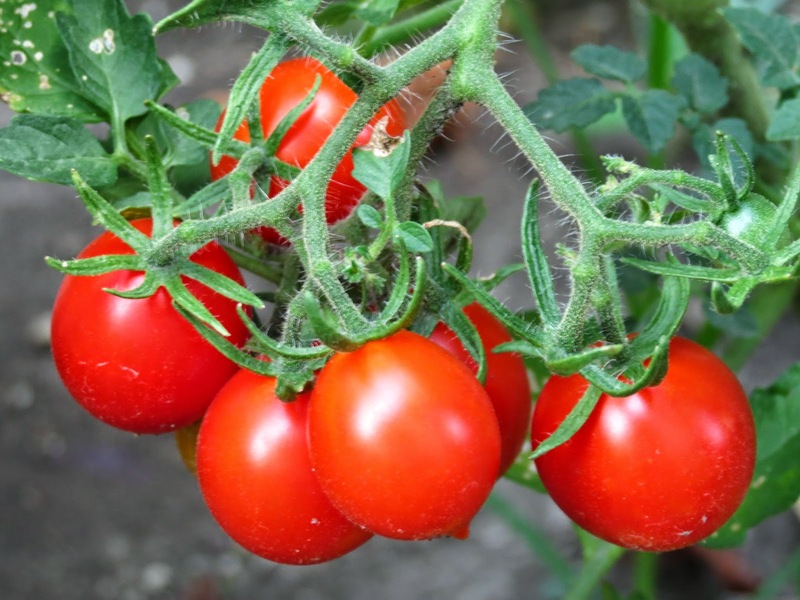 Tomatoes take a bit longer to grow, about 60-90 days but well worth the effort. 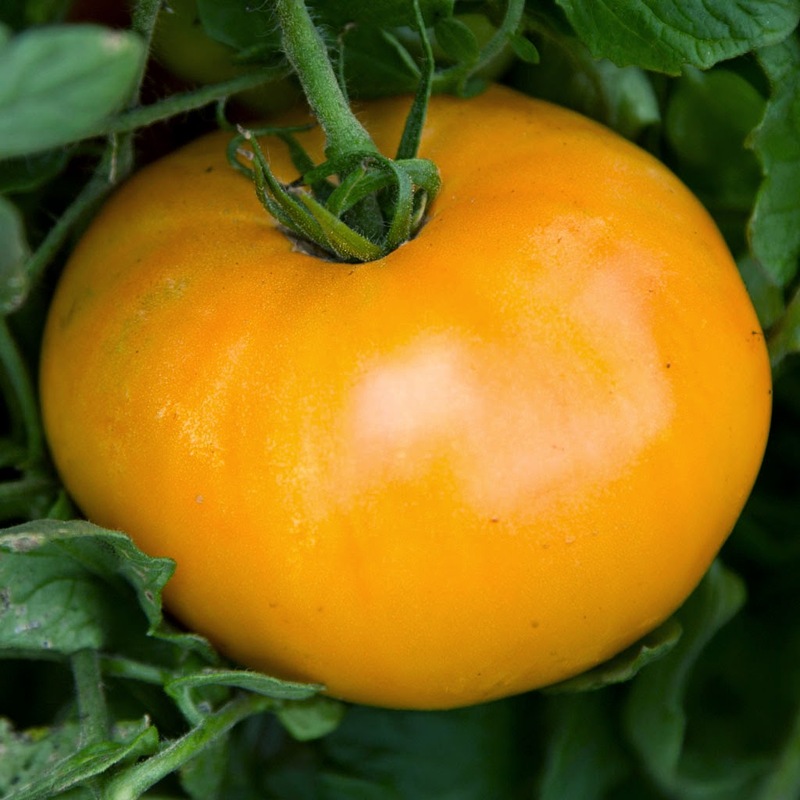 Mary's Heirloom Seeds offers 11 different varieties of HEIRLOOM Tomato seeds. Heirloom Tomatoes are so delicious and juicy! 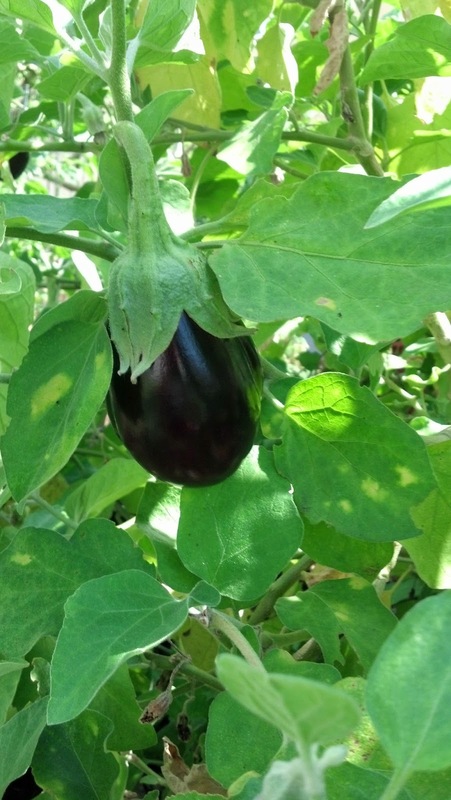 Choose from Cherokee Purple, Emerald Green, Amana's Orange, Cherry and Beefsteak varieties. Prices range from $3 to $4 for 25 to 45 seeds. If you've never eaten an heirloom or homegrown tomato you are missing out! As for meat, we have cut back. I'm not saying we have become vegetarians but we no longer eat meat twice a day. As the primary cook in the house I manage to prepare healthy, well-rounded meals using REAL food (not processed junk). I've decided to go back to Meatless Mondays. This is a great way to eat more veggies and cut back on our grocery bill. SPROUTS are another way to get nutrient-dense "greens" without spending lots of money or time. 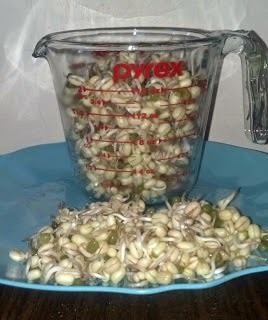 Mung Beans grow into Bean Sprouts in as few as 3-6 days. Mung Beans are my favorite! Check out Nutritional Info for Sprouts. SPROUTS can be grown in a glass jar on the kitchen counter. They don't need light or dirt...Just water! (except for holidays) Once your order has been processed. Shipping on Heirloom Seeds is Free within the Continental US!